The Prospector-1 mission will establish the first private base on a space object. This week, asteroid mining company Deep Space Industries announced detailed plans to launch the first private mission to an asteroid by 2020. The California-based company plans to build a successor to its Prospector-X test craft called Prospector–1, which will land directly on an asteroid as it passes near Earth. Although Prospector–1 won't be bringing back any gold or platinum, the historic mission will map the surface of the asteroid and analyze the rock for resources that could be useful in DSI's long-term plans. The company plans to pick its first destination asteroid from "a group of top candidates" selected by the company's in-house asteroid experts. 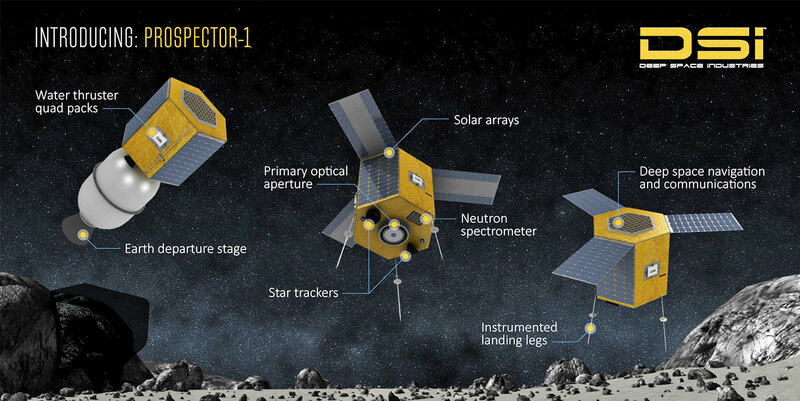 When Prospector–1 arrives at its target, it will map the surface and subsurface with both visual and infrared cameras and determine the overall water content before touching down on asteroid using those same water vapor-powered thrusters. Once it has landed, the humble Prospector-1 will be the first commercial base ever established on a space object, paving the way for DSI's next generation of asteroid harvesting missions. "Prospector–1 is not only the first commercial interplanetary mission, it is also an important milestone in our quest to open the frontier," DSI co-founder Rick Tumlinson said. "By learning to 'live off the land' in space, Deep Space Industries is ushering in a new era of unlimited economic expansion."